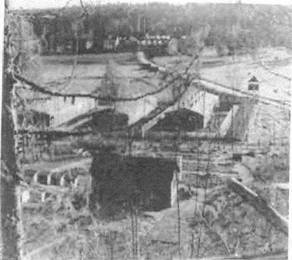 Accompanied by two officers and three guards we went by train to DuLag Luft (Oberursel near Koblenz ) interrogation camp located approximately 11 km north-west outside Frankfurt–on–Main, arriving in the after–noon of 10th April 1942. The word DuLag is an abbreviation of the German word durchgangslager or entrance camp, or transient camp, but it became synonymous with interrogation camp before distributed of the prisoner to other POW camps. DuLag Luft Oberursel was also known as Auswertestelle West Oberursel and as Kriegsgefangenendurchgangslager Oberursel. 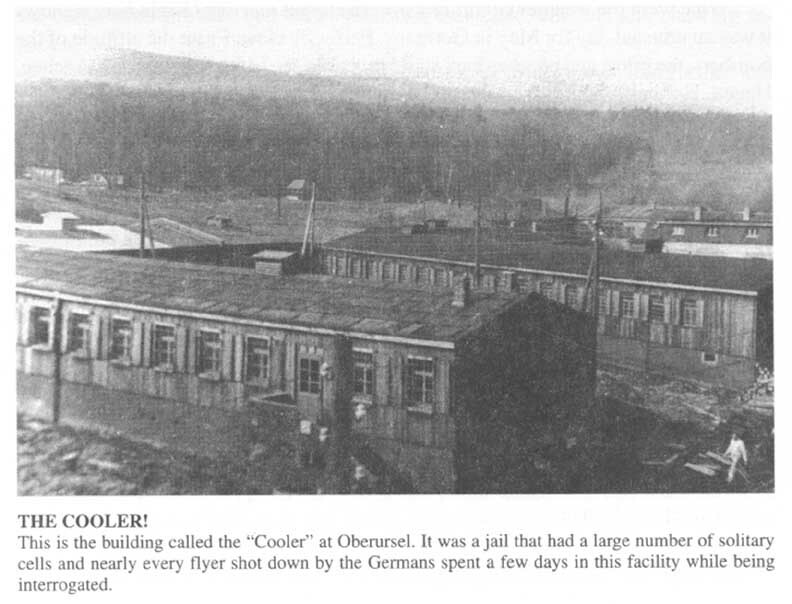 In operation from as early as January 1940, DuLag Luft Oberursel was the prisoner of war camp used as a clearing station for all downed aircrew. The camp was run by Luftwaffe Air Operations Staff and the Abwehr (German Intelligence). These were highly skilled interrogators led by master German Luftwaffe interrogator Hanns-Joachim Gottlob Scharff. 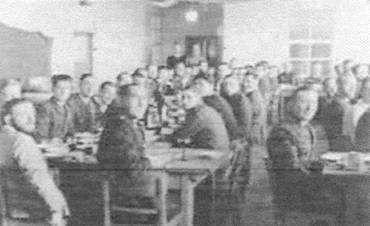 The camp was nominally staffed by 25-30 English-fluent Luftwaffe officers for detailed interrogations and another 15 to 18 for preliminary interrogations. Aircrew would be interrogated in what could be fairly rough methods. Any form of abuse and discomfort supposedly short of physical violence could be brought to bear to extract information. We were each put into a separate cell, striped to the skin, and, after about half an hour had our clothes returned to us. I was given POW #24803. I thought of escape from the moment I surrendered in the farmhouse kitchen. They found our special fly buttons and collar studs but I managed to conceal a compass the size of a dime which I kept in my mouth while I was searched and questioned. We were then taken to the interrogation centre and then given a bogus Red Cross form (see image at right). 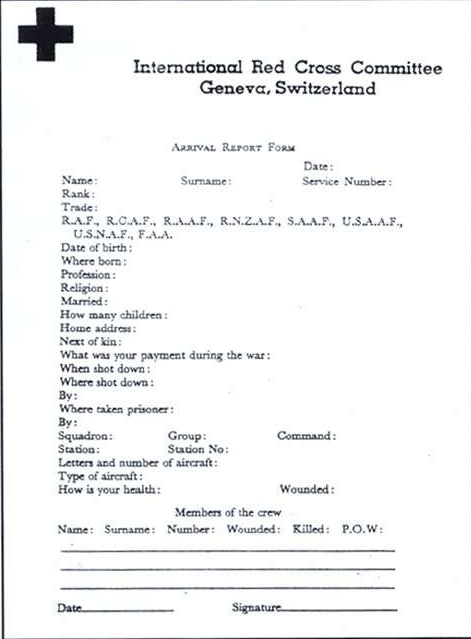 The form had nothing to do with the Red Cross, rather what the Germans wanted was the name of one's squadron and every other piece of information they could collect. The first three questions were name, rank and service number. Then they asked for home address, type of aircraft flown, point of departure, bomb load, name of squadron, etc etc. 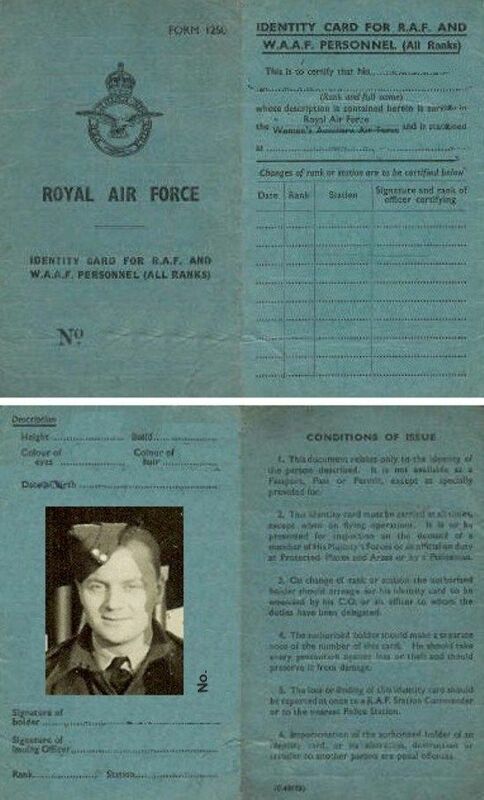 The interrogator told us that mess bills and a '1250' (ID Card) had been found in Howard's clothing, from which he had established our squadron number and our base. He appeared to be most interested in Group Captain Evans, our base commander. We maintained that we had never heard of him. 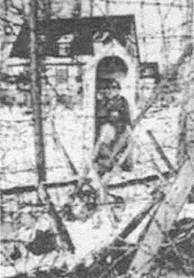 During the interrogation phase at DuLag Luft, I spent close to 4 days in solitary confinement, before being released to the main POW camp. Following the initial interrogation and perhaps some softening up time in solitary confinement, the Germans typically did not press prisoners who declined to talk. So many POWs passed through that it was more profitable to wait and find one who would talk than to wear down a prisoner who stubboringly only provided name, rank and serial number. 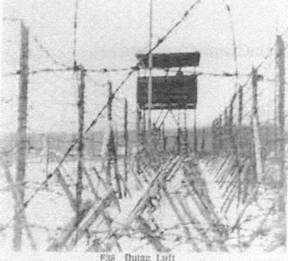 As mentioned earlier, the Germans had some highly skilled interrogators at DuLag Luft. (Editor's Note: See web page The Luftwaffe Interrogators at DuLag Luft - Oberursel as well as web page DULAG LUFT Prepared by MILITARY INTELLIGENCE SERVICE, WAR DEPARTMENT 15 July 1944 . A good description of the whole uncomfortable process of interrogating captured Allied airmen is in David Kahn’s ‘HITLER’S SPIES’. Chapter 9, ‘Questioning the Foe’. Also "The Interrogator: The Story of Hanns Joachim Scharff: Master Interrogator of the Luftwaffe" by Raymond T. Toliver (2nd Edition ISBN: 0764302612) is a good source. 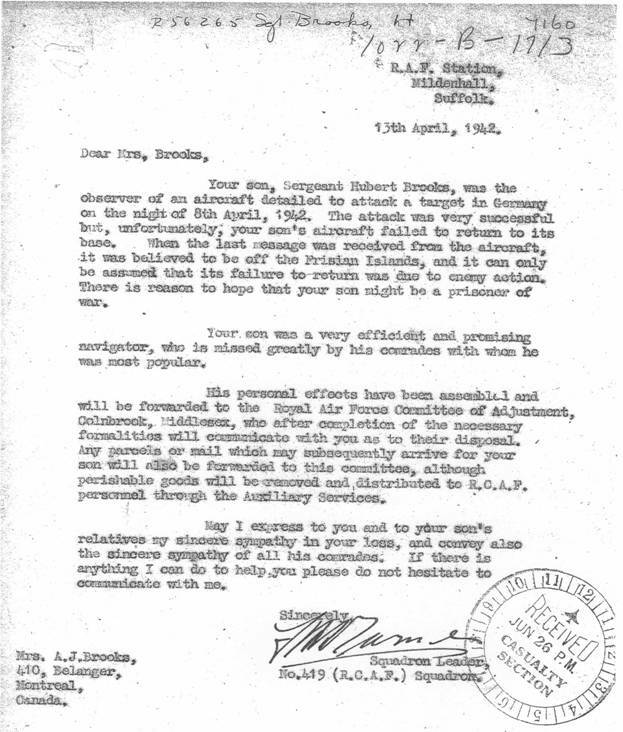 The Germans effectively leveraged the vast quantity of information that they collected about a prisoner or his squadron from a variety of direct and indirect sources (including from some prisoners who filled out the bogus Red Cross Form). With this apparently inexplicable detailed knowledge of intimate matters, the interrogator surprised some prisoners in conceding the truth of some innocuous items. Once the prisoner was talking, the interrogator got him to confirm some known information and then gradually led him to some new material. Afterwards, prisoners often rationalized their interrogation discussion as "the Germans knew everything anyways". I guess I was one of the many hard cases, as all they got from me was; name, rank and service number. Luftwaffe interrogation records from Oberursel apparantly did survive the war. They were scooped up by AirMin/A.I.12 advance enemy document teams and whisked away and sequestered by the Allied intelligence community. Today these records reside in London and Washington but are closed to the public. 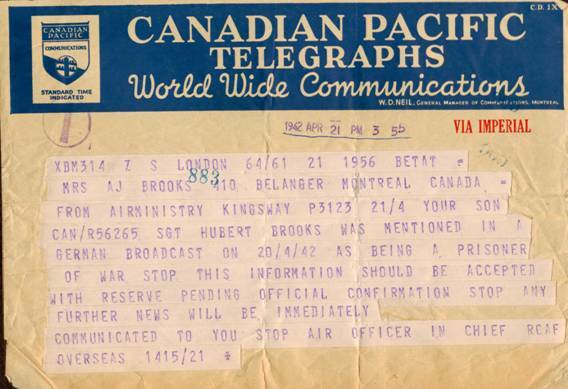 This was followed a few days later by a telegram offering some hope that I was alive and now a PoW. Some photos from DuLag Luft (Oberusel) as it was at that time courtesy of the RAF's Nick Fenton.